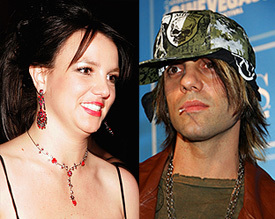 Illusionist Criss Angel told People exclusively that he is helping prepare Britney Spears for a possible MTV Video Music Awards performance, and their relationship is purely professional. "It's amazing what people think," Angel said. "We're not together. Her manager is my manager, and I'm helping with one of her shows. I'm helping with her appearance on MTV." Rumors flew after the Las Vegas-based Angel, 39, was spotted with Spears, 25, in Los Angeles in recent days, meeting with her and her friends at a restaurant and going with her into a hotel. Acknowledging the Wednesday night dinner he and Spears shared at Cravings in West Hollywood, Angel said, "Yes, I'm here working on some stuff, and we went to that restaurant with 10 people." "We were talking about how she wants to do something more with the [awards] show, and about me helping out and hoping to work with her on doing something to make her MTV appearance more innovative," Angel told the magazine. Spears has been in talks to perform at the Sept. 9 show at the Palms Hotel and Casino in Las Vegas. Britney's New Boy Toy: Cameron's Ex, Criss Angel?